SRI PURANDARA DASA ARADHANA 2011 By Purandara Committee 20th February 2011 – it was predicted that the temperature would sore high. As predicted, the temperature was quickly rising from as early as 8am!! Yet, the weather did not seem to bring down the enthusiasm of the group of volunteers who were well prepared for the arrangements to be completed in less than an hour! Music lovers had gathered in good numbers at the start of the program. As in the previous years, the program commenced with Pillari Geethe and Navarathna Malika. A week before the Aradhana, singing competition was held for various age groups from 6 to 18yrs. There were 18 participants in total. The participants were judged by very knowledgeable and well known musicians amongst the Sydney music community. It is heartening to note that each year the participants return with more confidence and enthusiasm thus improving the quality of their rendition. All participants received a certificate and memento as a token of appreciation, for their participation. 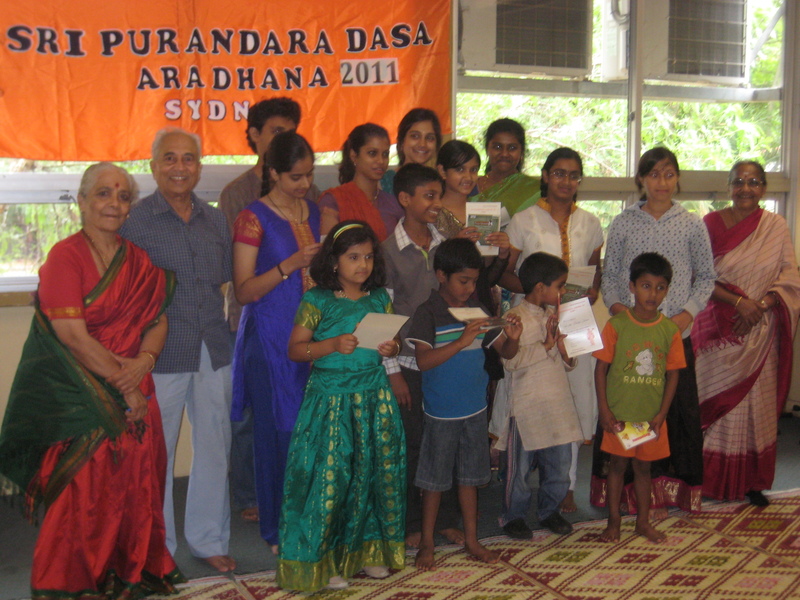 On the Aradhana day, after the Navaratha Malika rendition, the prize winners of the singing competition were given trophies, sponsored by individuals and families. Dr. Madhusudhana took the audience through a journey of time (as far back as 570 BC) and around the globe, showing a glimpse of many great minds. All along the journey, Dr. Madhusudhana drew the audience to the fact that Sri Purandra dasa was one amongst those great minds. His talk was well received by the audience. After the talk was the rendition of Purandara’s compositions by groups of children, youth and elders. About 16 different groups rendered a variety of compositions of Sri Purnadara. On 24th January 2011, the music world lost a great asset, Pandit Bhimsen Joshi, a well known Hindustani musician. It was very appropriate for the Sydney musicians and music lovers to pay homage to this great musician, a recipient of Bharata Ratna award (highest civilian award) on the Aradhana day. His song ‘Bhagyada Lakshmi baramma’ is ever popular. As a mark of respect and remembrance, a group of singers sang this song to conclude the day’s program. After the Mahamangalarathi, lunch was served. As always, a lot of volunteers pitched in to clean the hall and pack the items. Another year of success! A success attributed to all those who closely associate with the event every year – participants, audience, sponsors and volunteers.